Thanks, Vista. 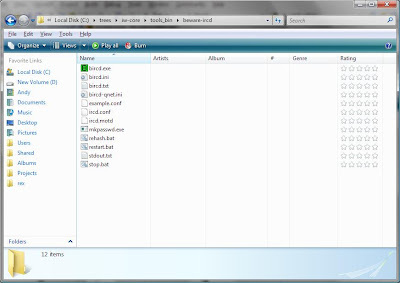 Even though at some point in the past, I went through and customized the details view with the columns I like (hint: they're the default columns from Windows 95, 98, 2000, and XP), then went into the folder options and set it as the default view for all folders, Vista still decided that this folder of ini, conf, and exe files is a Music folder. If you poke around enough, you'll find the View->Customize this Folder (different from Tools->Folder Options), where you can set the folder template that you want to use. I don't know how you'd do it if you have the menu bar turned off, which is the default in Vista.